This post draws upon an article in Seafood Business. You can see that article here. The geoduck (Panopea generosa), is a species of very large, edible, saltwater clam. The shell can grow to 8 inches in length,but the neck can grow another 3 feet. It is this neck that makes it interesting to foodies. The Geoduck can live a long time- up to 175 years and it takes over 30 years to reach market sizes. The common name is derived from an Indian word meaning "dig deep". The geoduck is native to the north west coast of North America and is harvested in Washington State, Alaska and British Columbia. The geoduck's attractiveness has created an $80-million U.S. industry. 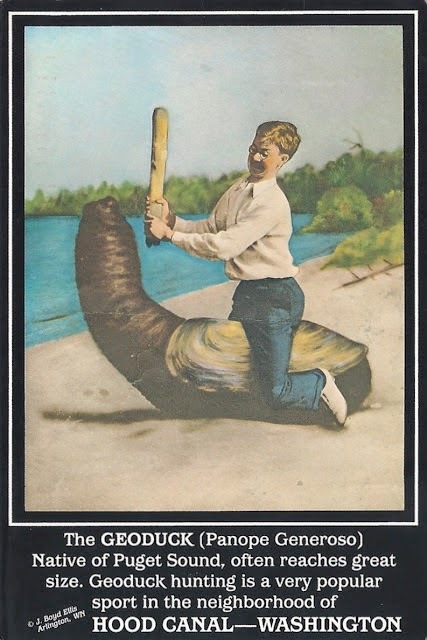 But alas there is trouble in Geoduck-land. In December 2013, China imposed an indefinite ban of geoduck that were imported from the west coast of the United States. In China they had been selling for $150 a pound. Chinese officials claimed to have found in an Alaskan shipment high levels of paralytic shellfish poisoning, a biotoxin that shellfish can accumulate which, when eaten by humans, can cause severe illness or even death. Some 90% of the geoduck catch had been exported to China. This may create an opportunity for US foodies and restaurants. The elongated giant clam is a rumored aphrodisiac, Northwest icon and reality TV star (appearing on “Anthony Bourdain: No Reservations,” “Bizarre Foods,” “Top Chef,” “Dirty Jobs” and “Chopped,” to name a few). To eat the geoduck you can pan fry it and savor its light, sweet flavor or include it in a chowder or sushi. Until about 10 years ago, most geoducks were wild and harvested by divers. But farmed production has grown to almost 1.5 to 2 million pounds annually. Most of the production comes from Taylor and Seattle Shellfish. There are also two dozen or so smaller farming operations. We are trying to figure out a way to bring this delicacy to a mass oyster event. While supporting oyster restoration you can take a walk on the molluscan giant side.